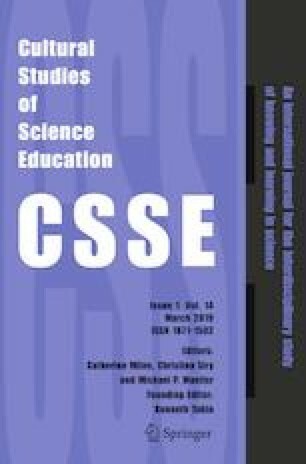 Studies of education practices in science centers have found variation in how conceptual learning is supported, or scaffolded, on school field trips. This paper investigates the implications of scaffolding variations for how students make sense of a game-based exhibit that was designed to trigger interest and develop knowledge of scientific phenomena. The data were gathered during a field trip by high school students (aged 16–17 years) to a science center. The activity was part of a larger design-based research project, and this study focuses on students’ encounters with a single exhibit while in small groups. The group arrangements are characteristic of how learning activities are organized on field trips and represent three common conditions for scaffolding: (1) peer-supported, (2) teacher-assisted, or (3) facilitated by a museum guide. Interactions in each condition were video-recorded, transcribed, and subsequently scrutinized using interaction analysis. The analysis shows how framing, dialogic approaches, and the game-based exhibit facilitated sense making within and across the different conditions. The paper considers the scaffolding intentions and means of each condition and discusses the consequences of the variations for the students’ conceptual learning. The complexity of science center exhibits is also considered, as the study identifies scaffolding challenges related to interactions with dense and comprehensive analogue and digital resources. This research was funded by the Norwegian National Research Council, Grant No. 201332.